We’re smack in the middle of winter and I’m finding myself wishing for warmer days and reminiscing over the trip to Kauai that Nishan and I took this past summer. 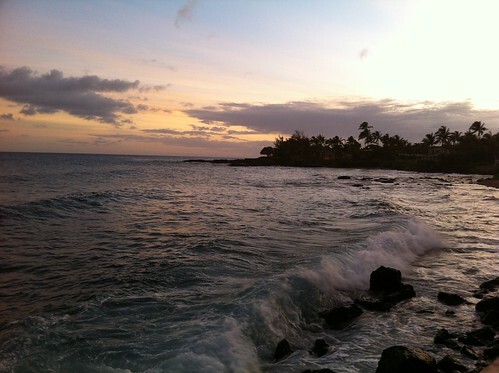 I hadn’t been to Hawaii since 2005, but that was for graduate school and I was too young to rent a car then. 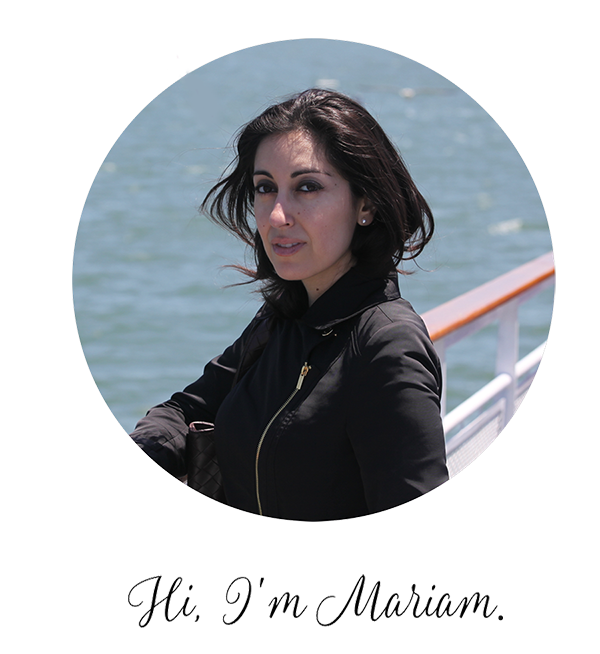 This time, Nishan and I picked up our car from the airport in Lihue and were on our way. 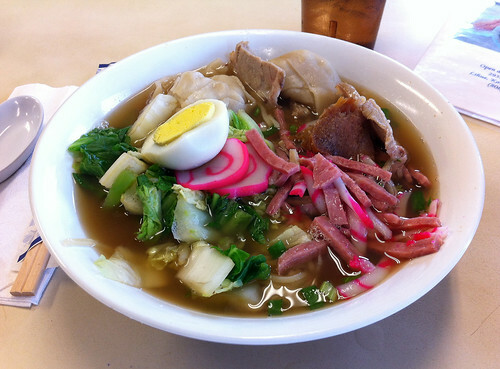 First stop: Hanmura Saimin. These saimin noodles are reportedly the best on the island, and while they were good, I was hoping for more. The noodles had a good bite to them but the broth was too salty and the dumplings weren’t meaty enough. Still, the restaurant’s casual vibe and the down-home fare was a welcome way to start our trip. From Lihue, it was a short drive to the south shore of Kauai. We were staying in Koloa, and I soon learned that driving from the north to south shores was only a matter of a couple of hours. Here’s the kicker: there’s no way to drive through the center of the island. 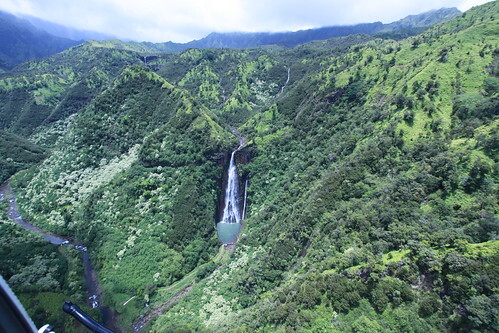 Nearly all the roads traverse the shores, thanks to steep inland valleys and Waimea Canyon. The Na Pali cliffs hug most of the northwest coast too, which means driving a full coastal circle around the island isn’t possible. All this nature makes for some incredible scenery, though. 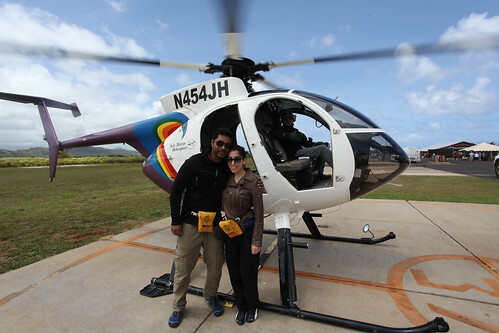 Speaking of the Na Pali coast, we woke up early the next morning to head back to Lihue for a helicopter ride around the island, organized by Jack Harter Helicopters. These glass-bottom (and doorless!) helicopters are scary, but the ride was worth it. 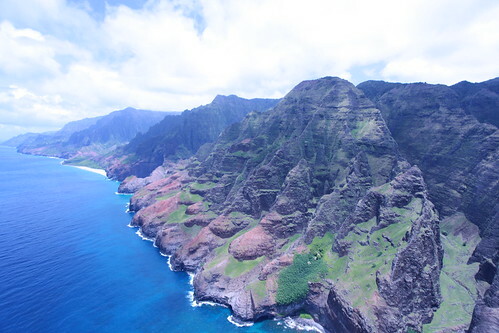 We spent a couple of hours seeing Waimea Canyon, Hanalei Bay, and the Na Pali coast. Thanks to participating in the helicopter tour, I have photographic evidence to prove that I too, was once brave. 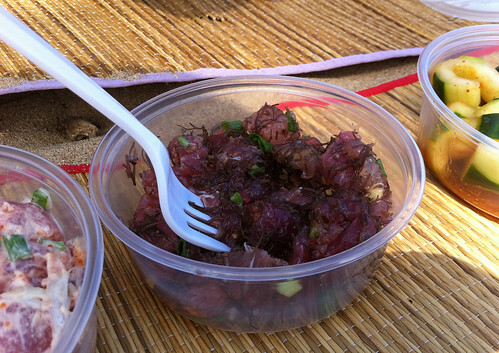 All that helicoptering makes a girl hungry, so afterwards we stopped by a fish market and picked up some tuna poke to enjoy at Kalapaki beach. Fresh fish on the sand, beachfront view, no complaints here. I also wanted to grab some produce before heading back to the south shore, so we stopped at the Kukui Grove farmers market for some fragrant papayas, bananas, mangoes, limes, and mint. 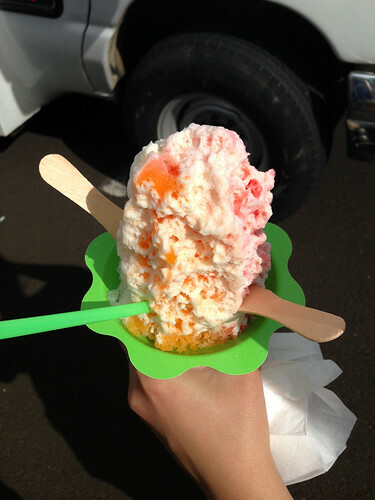 And I got sidetracked by shave ice. So colorful, so unhealthy. Mmm. We slowly made our way back to Koloa, with one last stop in Poipu for the evening. In Poipu, we grabbed some popcorn at Paradise Popcorn (hurricane, Hawaiian-style for me and crazy spicy popcorn for Nishan. I also learned that the proprietor used to live in Sonoma County. It’s a small world after all. 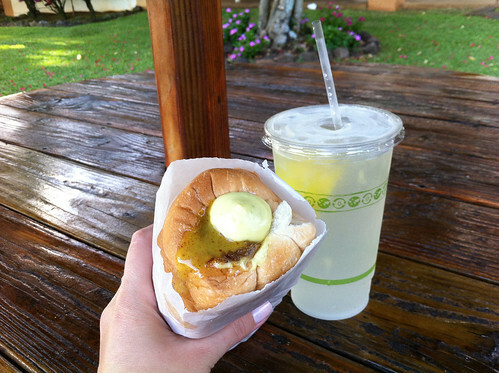 Because you can never eat enough after a helicopter ride, we each grabbed a hot dog from at Puka Dog, also in Poipu. I had a Polish sausage with spicy lemon secret sauce and starfruit relish. This was too sweet and way too doughy for me, but there’s always a line at Puka Dog so they must be doing something right. Back at home (aka our rented condo), we enjoyed a gorgeous sunset with rum cocktails in hand. Those farmers market limes and mint came to good use after all.